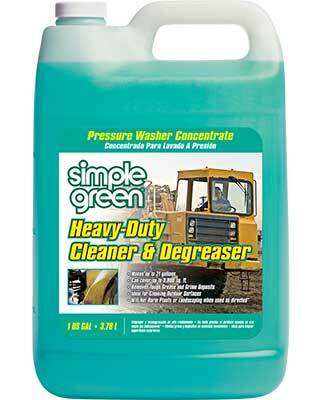 Simple Green Heavy-Duty Cleaner is a specially formulated, powerful pressure washing concentrate, designed to remove tough grease and grime deposits. This powerful formula was developed primarily to be used with pressure washing systems but can also be used for manual cleaning applications. It removes oils, grease, soot and ash, exhaust, sap, pollen, mold and mildew stains, road tar, and other tough soils. This powerful concentrate can be used with a pressure washer or manually to clean construction and landscaping equipment, boats, RVs, dirt bikes and motorcycles, ATVs, campers, bicycles, outdoor furniture, sheds and other outdoor surfaces. It removes the toughest messes including oils, grease, soot and ash, exhaust, sap, pollen, road tar, and stains caused by mold and mildew. One gallon of the economical concentrate makes up to 21 gallons of cleaning solution and cleans up to 3,800 square feet. The phosphate and bleach-free formula will not harm lawns or landscaping when used as directed and is safer for use in areas later visited by children, pets or wildlife.